The best place to start looking for your new Bamboo plants for sale is online where you will find lots of growers and information. Just visit your favourite search engine (we prefer to use Google.com) and type in exactly what you are after, e.g. “buy screening Bamboo plants” or “buy Timor Black Bamboo plants” etc. You will find a lot of websites returned in the search results to choose from. Of course, we would prefer you to go directly to our site at www.bamboos.com.au where we can provide you the best in Bamboo plants and prices. I note that people who do a lot of research first on various Bamboo websites are less inclined to haggle over price as they have seen what others are paying and are happy to pay our prices. The next thing to do is find and review any comments people have made about various growers, plants and service. Unfortunately, some people have had negative experiences when buying Bamboo plants online, so it is a good idea to look for positive references and to see how long the business has been operating. Once you are happy that you are in the right place, you can request a quote for the plants you are interested in. When doing this you will need to give plant species, pot/bag size e.g. 300mm pots and a delivery address so we can get an exact freight quote for plants to be delivered to the job. We have trucks leaving two or three times per week and most deliveries can be made within a day or two. If you are in Brisbane, we can usually get plants to you overnight and for much less freight costs than you would expect. If you are able to pick up from a transport company depot, the freight will be greatly reduced again. For example, one full pallet of Bamboo plants in 200mm pots (that is about 75 plants) will cost you just over $80.00 if you pick up at the transport depot compared to about $140 if delivered to your door. These prices are from our nursery to Brisbane. Prices for delivery to Sydney and Melbourne will be more expensive, but still great value. You will find that when dealing with a wholesale Bamboo nursery, minimum quantity orders will apply as freight is simply not viable for a small number of plants. 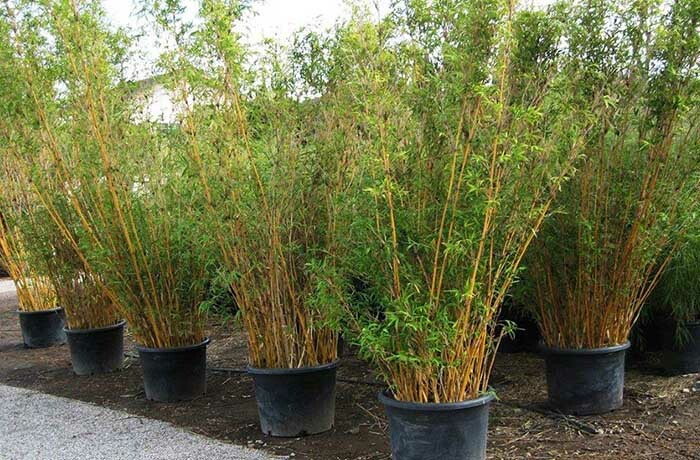 The wholesale Bamboo nursery will use only specialized freight companies and plants will be treated with wetting agents and given a thorough watering before loading onto transport so you can be assured of your quality Bamboo plants arriving safely at your door. This is especially so when the wholesale nursery export bamboo plants to overseas customers to meet the strict export quarantine requirements.